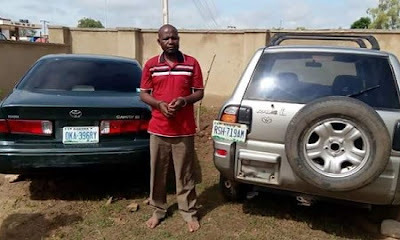 The Police in Katsina have arrested a notorious car snatcher and recovered two vehicles in the state. According to him, the cars recovered include, a Toyata Camry, 2000 model, green in colour, Chassis No.4TIBG22K6Y495726 with registration KJA 432 EG and a Toyota RAV4 Jeep, ash in colour with reg no. RSH 719 AM. The police image maker however maintained that, the suspect will be arraigned in court on completion of investigations.